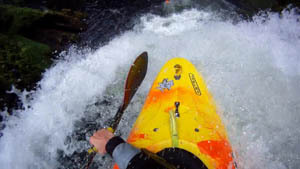 Ever since I first started to kayak I had dreamed of going out west. This year with the snow pack low in California, it only made since to go to the Pacific Northwest. It all started at 4:30 am when Kevin Nunns and I started the drive across the country from Asheville, NC to the Oregon. 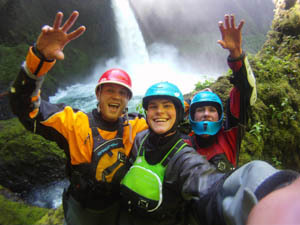 Just a day and a half later we found ourselves in the whitewater paradise called Hood River, OR. 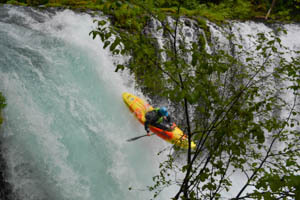 From the time we arrived we only had one thing on our mind… the Little White Salmon. We started off our first day with sweet LDub lap, with Nicole Mansfield, Hunt Jennings, and Jordan Poffenburger. 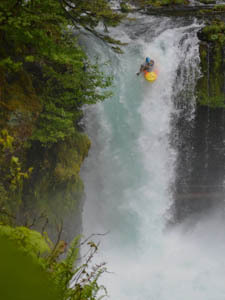 The LDub was everything it was talked up to be, consisting of epic scenery, quality rapids, and crystal clear water! 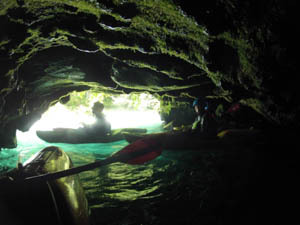 First Spirit for the trip. A sweet cave below Backender on the LDub. 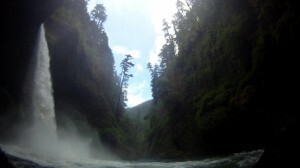 After a few days paddling theÂ LDub, a front moved in providing the gorge with a decent amount of rain. 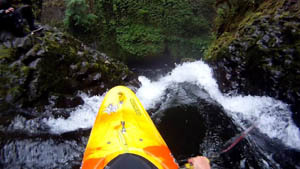 With waterfalls on our mind Hunt, Jordan, Kevin, Steven McGrady, Clay Lucas, Chris Morelli, and I drove to Eagle Creek. Upon arriving were saw that the level was perfect, so the nerves built and we started the hike up. Before we knew it we were at the canyon rim starring at the 82′ tall Metlako Falls. After hiking up another half mile up to Punchbowl falls, we floated into the enchanted forest that is Eagle Creek. 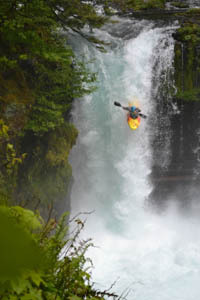 With 5 short days of training on the LDub and some waterfalling, race day was here and the stoke was high! Racing the Little White wasn’t something for the faint of heart, even on a normal day of paddling the river you tend to be a bit nervous, nevertheless paddling as fast as you can. The race course is 15+ minutes long with countless moves and lines to remember. With only a few laps under my belt, Clay Lucas and I decieded to do the team race! 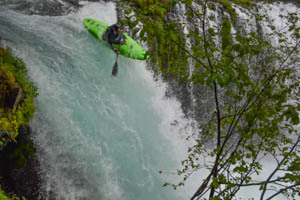 The race started out at the top of a rapid called Gettin’ Busy, a very long boulder garden stacked with tons of moves. 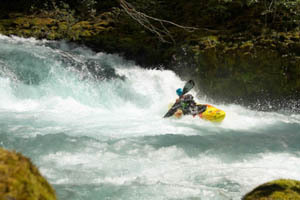 From then on the course continues on down through countless classic class V rapids, ending at Wishbone Falls. I was pretty excited to have clean lines throughout the race, and Clay and I managed get 5th place in the team division! After the race we heard that the classic Upper Cherry Creek was going to be in the next two days. After 4 1/2 hours of driving we soon got word that the Upper Cherry was too high and it wasn’t going to be in for a few weeks, time that we didn’t have to spare. As it was still raining in and around the Columbia River Gorge we saw that the Lewis River was at a near perfect level for Upper Falls. On the drive to Lewis we manged to take a 2 hour detour and pay 6 dollars a gallon for some gas… This made the trip just that much more interesting. After arriving at the falls we hiked a short distance in, ran a near perfect and fluffy 20 footer, and were at the top of Upper Lewis Falls. 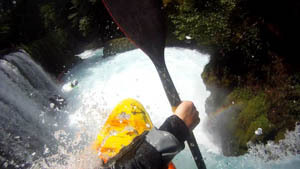 With a 200’+ long horizon line, a gnarly cave on the left, and potential to clip your stern on the first drop Upper Lewis Falls was one of the more intimidating drops of the trip. 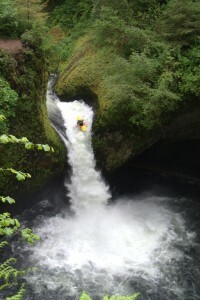 After scouting for awhile we all gave errr’ with sweet lines from most, and a slight back injury to one paddler. 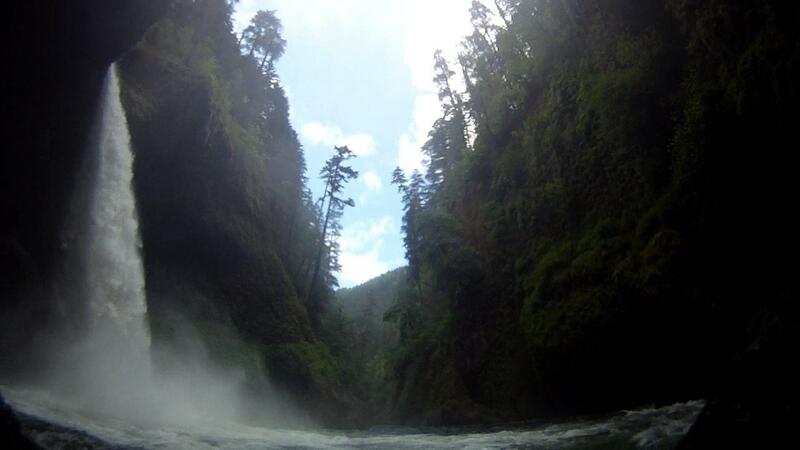 The Upper Lewis adventure ended up being epic to say the least. 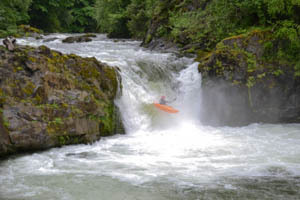 First Drop on Upper Lewis Falls. With some different creeks in mind we headed out to Canyon Creek and the East Fork of the Lewis. 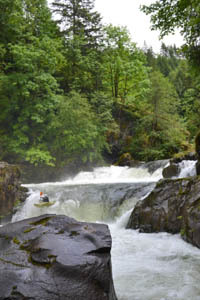 Canyon Creek ended up being some of the best class IV ever and the East Fork had some super sweet drops too!Â After a good bit of running waterfalls, it seemed as though we just couldn’t get enough of them, so we headed back to Eagle Creek for a even better/high water level. Punchbowl was defiantly a bit more challenging at this level and I ended up running it backwards (surprisingly the softest hit of the trip)… The rest of our trip consisted of plenty of Ldub laps, high water Green Truss, the Farmlands, Wind, and the North Fork of the Payette. The west was everything I could have dreamed it to be and I will defiantly be back next year for more! Stoked in the deep canyon below Metlako after round 2! Check out some more photos and an edit I put together from our trip below! The C-1 ninja Jordan Poffenberger has spirit! 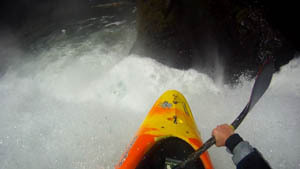 Stephen McGrady boofing the 20 footer on Canyon Creek. Saunders Southecorvo crushing it on Canyon Creek. In the canyon below Metlako. 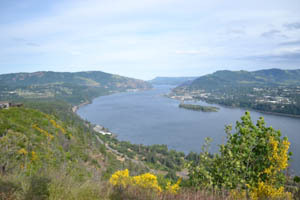 Overlooking the Columbia River Gorge from the Washington side.